At the risk of turning into the VNN (Voltaggio News Network) a source once removed from this writer confirms that brother Michael is in town for the viewing party. To me this indicates that Michael didn’t win and there is a high liklihood that Bryan did. We’ll see. 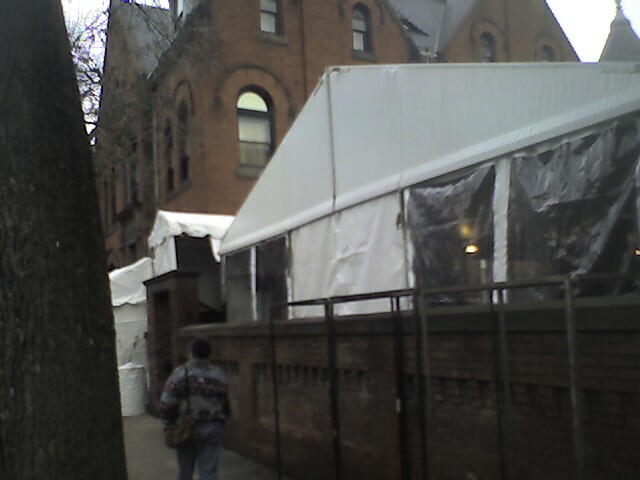 Was walking up Market Street yesterday and saw that they were putting up some big tents on Volt’s grounds for what I assume will be a viewing party for the Top Chef finale. Snapped this crappy picture with my cell phone. Fred’s mailbox has no invitations to the party! Even if I could somehow come up with an invite in I would probably have to pass as it would certainly cause some major friction at stately Fred Manor if I was anywhere but on our couch at 10 p.m. We’ll certainly be cheering for Bryan! On the other hand I have reservations there tomorrow for lunch with some friends so things could be interesting if he wins! I’ll keep you posted. Full odds and story here. EDIT: Nice catch Shannon and thanks! The actual new post-restaurant wars odds are here. Now it looks like it will now cost me $55.56 to hedge. If only I could. Stupid federal anti-gambling laws. No- It’s not that I have reservations about Volt it’s getting them. My parents just tried to make a Friday night reservation at Volt and there was a six week wait! Fabulous. I wish Bryan, Hilda and the whole staff all the success in the world- it looks like they are getting some serious Top Chef buzz . What’s it going to be like if he wins? All of us in the Fred household have been following Top Chef religiously. Actually we have watched the show as a family since season 2. Since we TIVO it I have been ducking the front page of the Frederick News Post on Thursday mornings and my office is forbidden to discuss it in my presence. Of course we are rooting for the local boy and there has been much cheering at Bryan’s victories. In fact a promise was made that if he wins Top Chef the whole family is going to Volt. Here is an interesting Las Vegas blog that gives the official odds. Bryan is in 4th place according to the bookmakers after week seven. Not surprisingly Michael is in first. NOTE: the blog contains spoilers so don’t look at it unless you are current with Top Chef.